It's only March, and it's already time to get in the holiday spirit. Universal Pictures and Illumination have finally unleashed the grump. Yes, today we get the first official full-length trailer for the animated adventure The Grinch, which has been a longtime coming. Yesterday we got to see the ol' grouch and his best friend Max on the official one-sheet. Now comes the first footage from the movie, following a Winter Olympics teaser that put The Grinch in the rink for a little classic ice skating. Now, we get to hear Benedict Cumberbatch in all his glory. Academy Award nominee Benedict Cumberbatch lends his voice to the infamous /the-grinch-movie-2018-teaser-trailer-winter-olympics/Mean One, who lives a solitary life inside a cave on Mt. Crumpet with only his loyal dog, Max, for company. 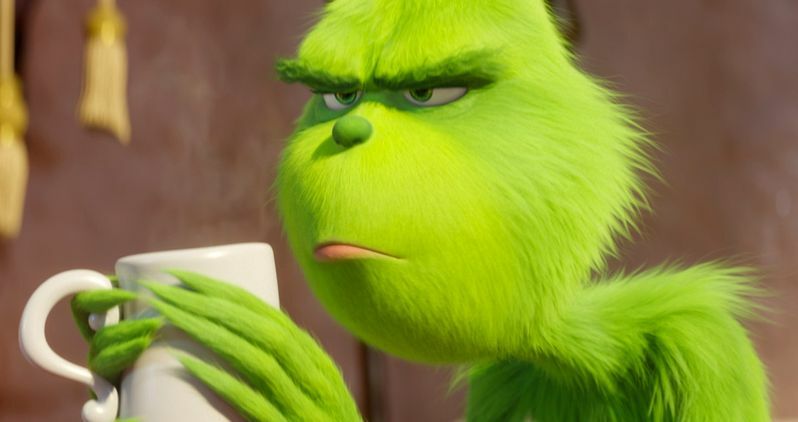 With a cave rigged with inventions and contraptions for his day-to-day needs, the Grinch only sees his neighbors in Who-ville when he runs out of food. Meanwhile, down in Who-ville, Cindy-Lou Who-a young girl overflowing with holiday cheer-plots with her gang of friends to trap Santa Claus as he makes his Christmas Eve rounds so that she can thank him for help for her overworked single mother. As Christmas approaches, however, her good-natured scheme threatens to collide with the Grinch's more nefarious one. Will Cindy-Lou achieve her goal of finally meeting Santa Claus? Will the Grinch succeed in silencing the Whos' holiday cheer once and for all? Find out, Christmas season 2018. We have the first trailer for you to watch right here. It comes direct from Illumination and is as grump-tactic as you'd expect. It may be spring break for the rest of the world, but in Who-ville, even in March, it's always Christmas!